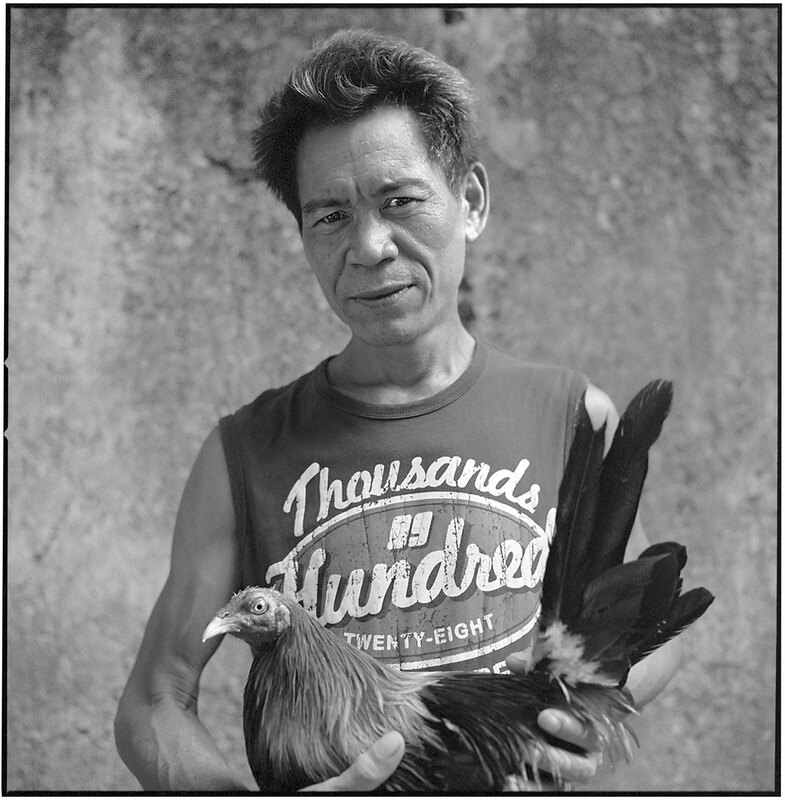 Between December 2014 and December 2016, I photographed sabungeros (cockfighters) at illegal cockpits on the Visayan Islands in the Philippines. It’s difficult to overstate the importance of sabong in Filipino culture. A thriving scene of gambling and corruption surrounds the fights, whether in sanctioned super-stadiums or illegal, open-air dirt pits. Critics decry sabong’s destructive effects on impoverished communities. This portfolio offers a glimpse into this unique spectacle while advancing aesthetic and ethical questions—particularly the question of animal rights as viewed across cultures. It operates within the peculiar tradition of subjective documentary photography, with a vigorous, process-oriented strategy. Captured on 120 and 35mm film, these black-and-white images are presented in full frame, without cropping. Description: After winning a significant prize fight, Romy, a “big player” in the Kamputhaw scene, revels with Ramsy and Boks, younger sabungeros caught up in the excitement. Description: Kyky (15) and Cococy (12) are too young to enter the cockpit, but they assist their elders with training, handling and preparing manoks (roosters) for prize fights. Description: Large, razor-sharp spurs are attached to manoks before entering the cockpit. The fights are usually fatal to the losing manok, and the winning rooster is often critically injured as well. 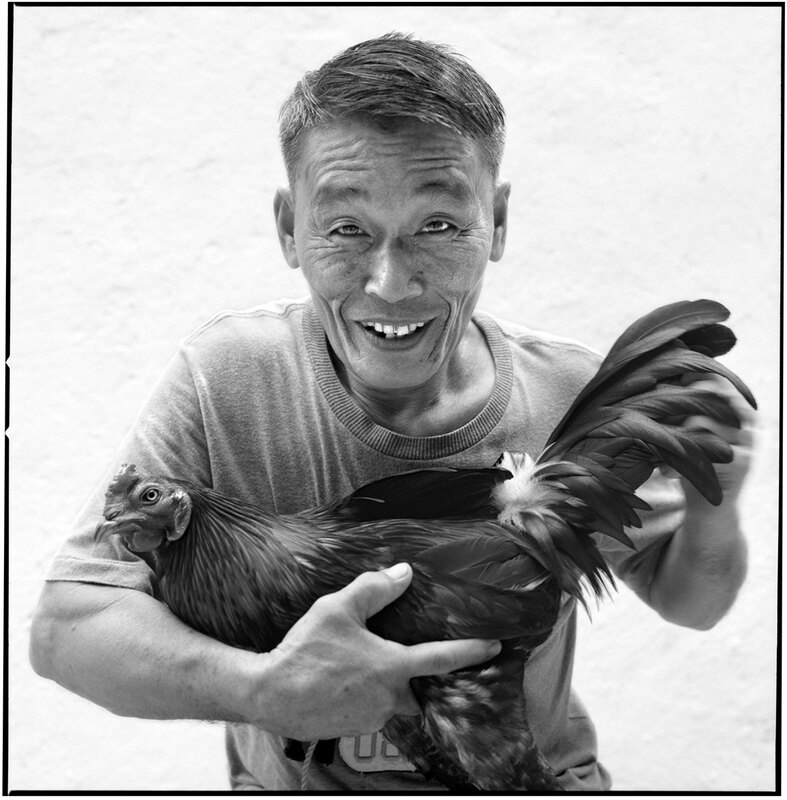 Here Bong holds his rooster while a gaffer firmly laces the spur behind the foot. Description: Six-year-old Berber, holding a prize-fighting manok, stands at the periphery of the sabungan (cockpit) with friends Carlos and Isagani. Description: Gilbert cradles his manok, which he calls "Pula" ("red"), before entering the cockpit. Sabungeros generally do not name their roosters. 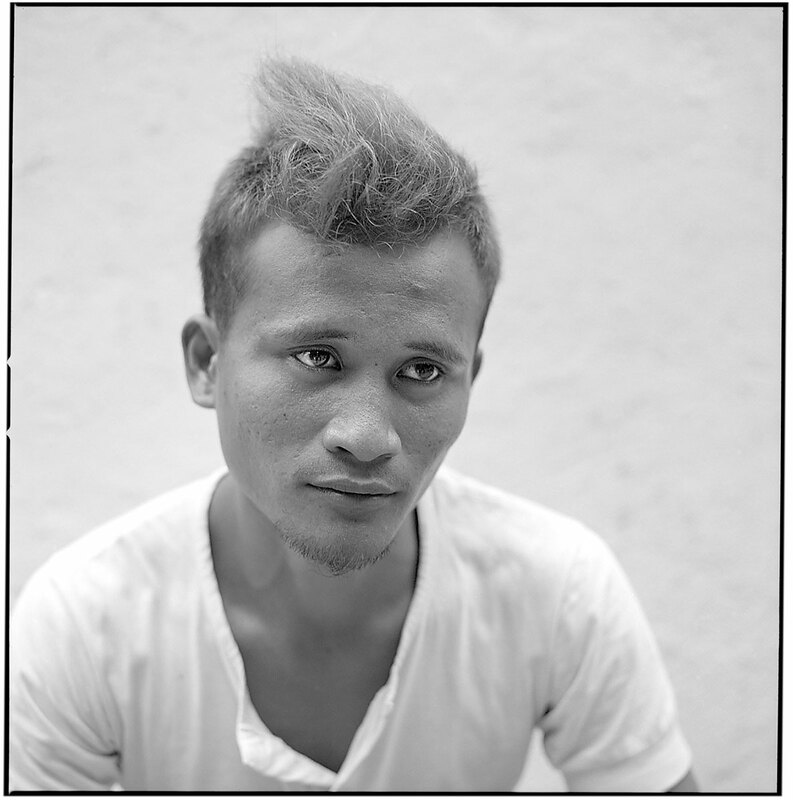 Gilbert was first photographed at the illegal sabungan in Kamputhaw in 2014. A year later, Gilbert had left that scene to join the activity at a cockpit closer to his home. Description: Arnold (50) drinks beer and eats snacks while watching the action at the Kamputhaw sabungan. Description: A tense moment preceding the battle. Description: A manok seizes the advantage and delivers a killing blow. Taken from an overhanging tree, this photograph gives an overview of the Kamputhaw cockpit during a fight. Here, raucous bet-taking has suddenly shifted to near-silence at a critical moment. Description: In the cockpit after a fight. Description: A trained manok represents a significant investment of time and money. They are often injected with steroids and clotting agents before fights to improve performance and stanch wounds. Here, on the Camotes Islands, a victorious but severely wounded manok undergoes an operation in the hope that he will live to fight again. Description: A cockfighter at the Kamputhaw sabungan. Description: A 21-year-old cockfighter in the Lower Pasil Shantytown (aka the "squatter's slum"), preparing for the afternoon's fight. 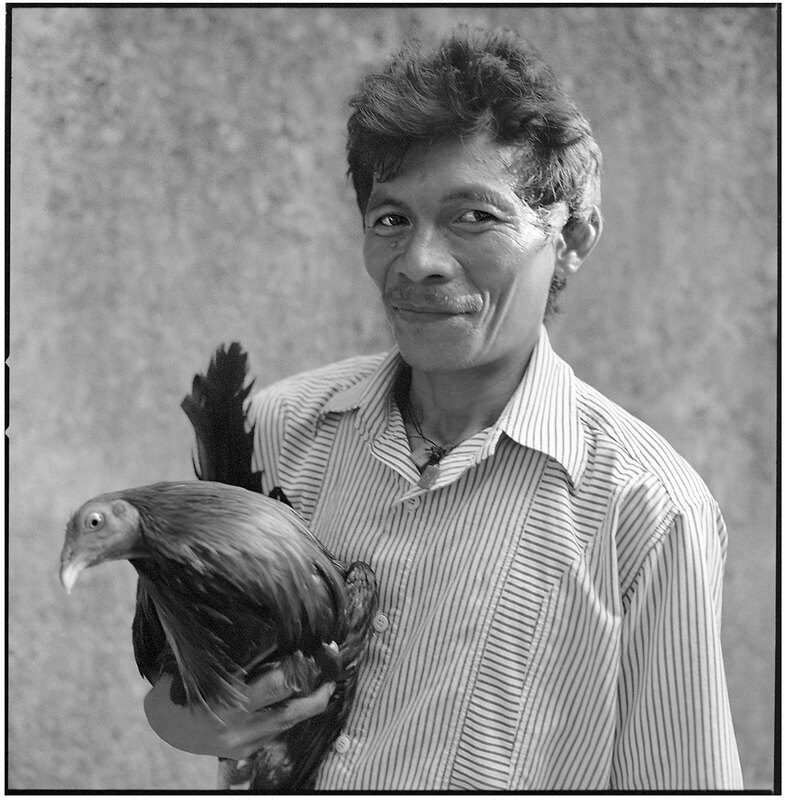 Description: This gaffer holds a severed foot from a manok killed in a fight. The spur will be removed and reused. Description: Romy, who works as a carpenter, is shown two years after first being photographed. Often a boisterous prankster, he is known as a "drunkard" in Lower Pasil. Description: An older cockfigher at the Cabangahan sabungan. Description: A sabungero at the Cabangahan cockpit. Description: A young sabungero at the Cabangahan cockpit. Description: Dinonisio, an ice cream vendor at the Kamputhaw sabungan. The cloth under his shirt pads the weight of the cooler he slings over his shoulder. Description: Manoks killed in combat are swiftly collected by hard-working butchers. They are then quickly defeathered and boiled three times in fresh water. Some Filipinos refuse to eat them because they fear this process doesn't completely remove hormones, steroids and clotting agents. Description: Preparing to enter the cockpit in Pit-os, Christopher holds aloft his manok with aplomb. 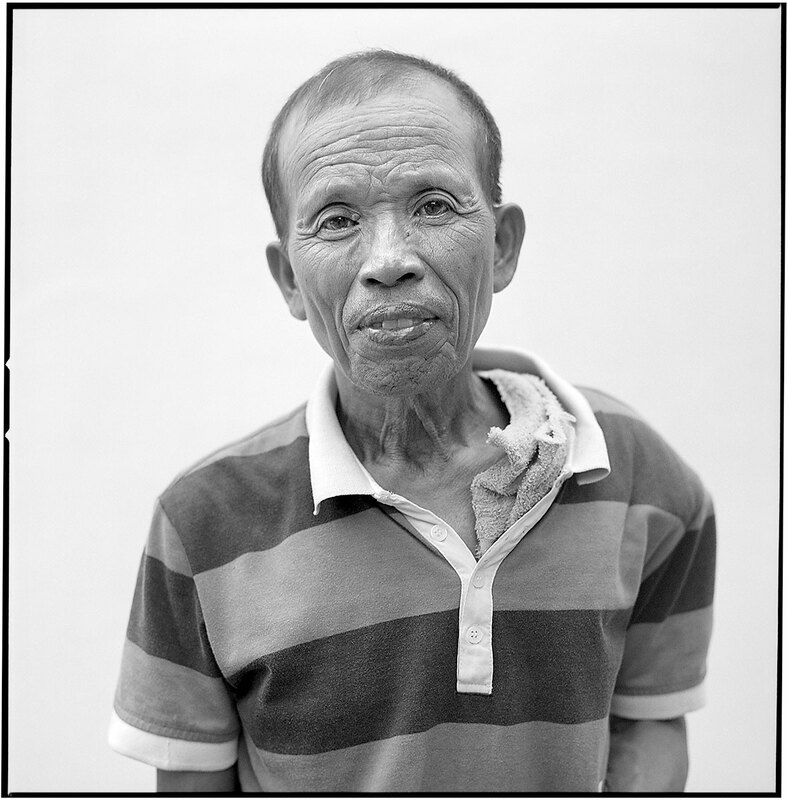 Sabong is a source of masculine pride throughout the Philippines. This illegal cockpit is in a walled-in private lot in metropolitan Cebu City. Sabong takes place every Sunday afternoon, though it is sometimes interrupted by police raids. The Kamputhaw neighborhood was the primary focus of this project. A dense honeycomb of interconnected, ramshackle dwellings, known as the "squatter's slums," Lower Pasil is a staging area for sabungeros who fight at the nearby Kamputhaw cockpit. In the idyllic hills above Pit-os, sabong takes place in a covered cockpit next to a graveyard. Fights are held every day except Sunday, when activities move down to Pit-os. Though this sabungan is illegal, it is apparently protected from police interference by the local community councilman, who is involved in its operation. A government-sanctioned cockpit in the urban outskirts of Cebu City. “Pit-os” means “hardship” or “claustrophobic.” Like many areas of Cebu City, gridlocked traffic, pollution and overpopulation torment residents. An insular community cockpit on rural Pacijan Island, 63 km (39 mi) east of Cebu City in the Camotes Sea. These full-frame images were captured on 120 and 35mm negative film with the Hasselblad 500 C/M, the Hasselblad Xpan and the Nikon N90s. The Xpan can make standard (36mm x 24mm) or panoramic (65mm x 24mm) exposures. Special recognitions to Nayz Cabading: Without her research and assistance on location, this project would not have been possible. Thanks also to Alvan "Butch" Magallones, Lawrence Villanueva, Marc Maximov, Harlan Campbell, the Center for Documentary Studies at Duke University and Through This Lens. In 2017, these prints were displayed to the public at Through This Lens Gallery in downtown Durham, NC. The opening reception was on February 17th. The show closed on March 11th. Sabungeros (Cockfighters) Exhibit Detail. 2017. Copyright douglasvuncannon.com, 2014 – 2017. All rights reserved.